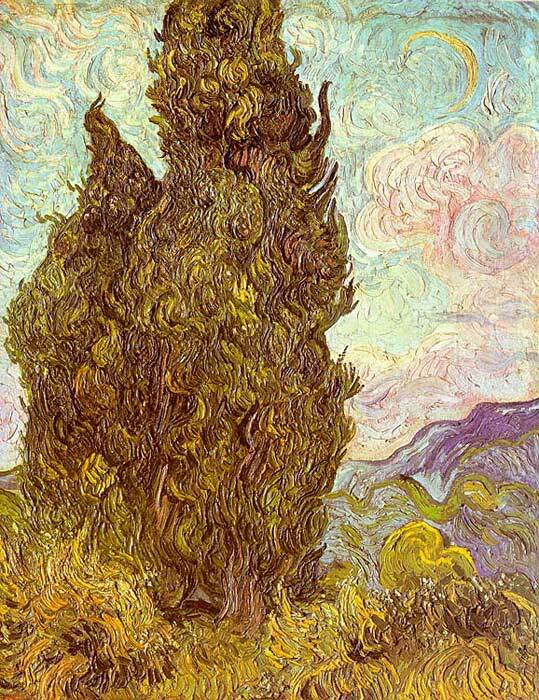 Van Gogh's "Le Cypres" or, in English, Cypresses, was painted in 1889. It shows two cypresses, on a sunny landscape of grass, rolling hills, mountains, and a clear blue sky. These trees are overbearing, large, dark and almost scary and intimidating, however this painting is a very beloved one. It evokes feelings of danger, power and turmoil, but the bright background makes it human and beautiful. Van Gogh uses large, thick brush strokes to illustrate the swirling leaves of the cypresses. The paint is so thick that clots remain on the canvas. The trees, although they are green, have hints of black in them, which evoke feelings of hidden dangers. SPECIAL NOTE : The painter will make the reproduction as close to the original oil painting as possible. If you want your painting to alter from this likeness, please email us and " Two Cypresses, 1889 " will be reproduced according to your special requirements.